Any value in forum signatures as blacklinks ? This is an question often asked in webmaster forums by members who are new to search engine optimization. It’s to give you a direct answer for this question. 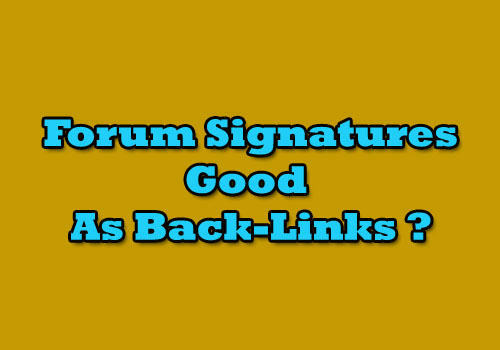 There aren’t much value in them as quality back links but there are some uses in these forum signature links. Maybe 9-8 years back there was huge demand for these links as back-links. Everyone used to by forum links from reputed forums like Digitalpoint, Namepros, SitePoint etc. Those days doFollow links could make a big effect on your sites SERP and also Google page rank. Even I used to by forum signature links from Namepros and few other places. There were those who would earn more than $100 just by selling signature links of their Digitalpoint account. But then Google changed their algorithm and golden time of signature links were over. Now people avoid using these back-links for their money sites because too many links from one site might look too spammy from Googles view. Also most forum have noFollow attribute for these links. So do we have any use of these links at all ? In my opinion yes. There are several ways you can use these. You can use forum signatures as a great Indexing tool. People use indexing services to get their new pages and posts indexed by Google. If big forums have massive number or topics so there are thousands of indexed pages which visited by search engines daily. If they have 100,000 topics and lets say Google search visit at least 50,000. Even if Google search spider comes to your site at least 1000 times it would be great for your new content. Cool thing is this would happen daily without you do anything and it’s also totally free. Also if you have a catchy anchor text for these links forum members will be clicking and visiting your site. That will be a nice source of natural traffic. It’s AdSense safe and also can be used for other affiliate programs such as Amazon. So even if there is no value as quality back-link, still these links are useful. I really do like when forums use noFollow for signature so that way our sites won’t be at risk having spam links since these links won’t pass any link juice. This is why I still use forum signature links for my sites. These nofollow links bring quality niche specific traffic to my sites and also work as free link indexer.